After showing a concept version of the 208 GTi at the Geneva Motor Show, Peugeot has officially launched the production version at the Paris Motor Show. It will go on sale here in Spring 2013 with prices expected to start at around £18,500. It's powered by the turbocharged 1.6-litre THP with 200bhp, an engine that's already fitted in the impressive RCZ. This gives the little 208 a 0-62mph time of less than 7.0 seconds and Peugeot is promising strong in-gear performance helped by a kerbweight of just 1160kg and torque of 275Nm. The GTi also gets a reworked exhaust and close-ratio six-speed manual gearbox. Official economy is around 45mpg and CO2 is 145g/km. The standard 208 has had a mixed response since its launch earlier this year with criticism of the steering and handling. Whether the GTi version will be any different remains to be seen, but it does come with revised suspension, shock absorbers and anti-roll bars while there's an enhanced front subframe and a more rigid rear crossmember. The steering has been made firmer plus there are 17-inch alloy wheels with 205/45 tyres. There's also a 10mm wider track at the front and 20mm wider at the back. As you'd expect of a GTi, the 208 gets a sportier look, athough it's still fairly subtle. There's a mesh grille along with different bumpers and side skirts. At the back there's a gloss black rear skirt with trapezoid twin exhausts plus there are red highlights on the brake calipers, lower grille and Peugeot badges. Inside the 208 GTi continues the theme with red stitching on the seats and dash plus red trim throughout. The sports seats are a Nappa leather and cloth combination while there are also aluminium pedals. To celebrate the launch of the 208 GTi, Peugeot is to sell 29 special editions in the UK - one for each year since the 205 was introduced. These special editions will be individually numbered and get a higher standard specification including an exclusive satin pearl paint job and DAB radio. 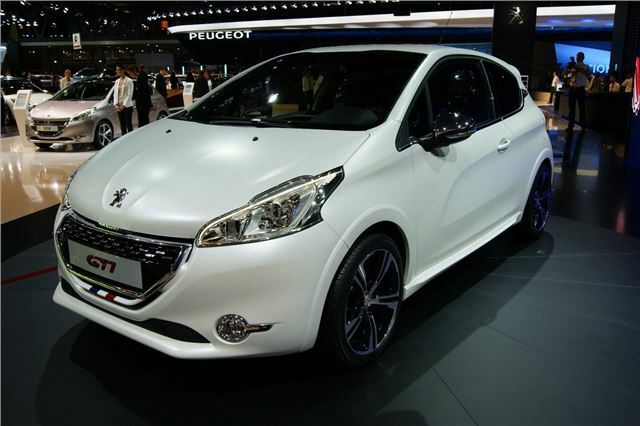 The 208 GTi Limited Edition will be priced at £20,495. Agree, but Peugeots exellent handling reputation gained during the the 405, 205 and 306 era were squandered with the advent of the initially ill handling 406, which needed bushing revision after press launch day, and the 206 which had inadequately located rear suspension and poor steering rack bushing for several years before necessary revisions were made.